I would think the Amazon sellers would even beat that price. It is 70 cds though. Last edited by Itullian; Sep-08-2014 at 03:16. In the UK, it's slightly cheaper at MDT, but they add postage, whereas it is free on Amazon. can't wait to get myself down to King's Place in London this weekend where they are hosting a series of free events publicising the set, and playing excerpts from the new sets. I must say it's encouraging to see Warner putting as much time and effort into marketing a classical project as they might do a popular one. Warner's takeover of EMI may prove not to be such a bad thing after all. You have to read this extended article about new Callas boxset, and the sad stories about existing 1997 EMI Callas releases. Thanks for posting this, DA. Very interesting indeed. I hope Warner have done a good job, and taken into consideration some of the mistakes on previous issues. I'm looking forward to hearing excerpts from the recordings at King's Place London this coming weekend. So I bought September's BBC Music Magazine, the covermount CD of which has 5 Callas tracks from the new Warner Remasters. BBC Music Magazine list the arias only, not the orchestras and conductors and seem a bit unsure of what they have. The arias are listed as having been recorded between 1955 and 1961, when clearly the Carmen excerpt is taken from the studio recording of 1964, as it includes chorus. So, what we have here are the Habanera from the complete Carmen, Casta diva from the second Norma, J'ai perdu mon Eurydice from Orphee et Eurydice, Un bel di from the complete Madama Butterfly and D'amor sul'ali rosee from the complete Il Trovatore. Immediately noticeable is not only that the voice has more presence, but the orchestra too, especially in the Butterfly, which I compared with my Callas Edition copy, where the sound is altogether flatter and more boxed in. Looking forward to hearing more at King's Place at the weekend. Please explain. Am I hearing something different from what was recorded in 1953?! "Yet, this Tosca, as initially released in 1997, contains a profoundly disturbing example of engineering recklessness. 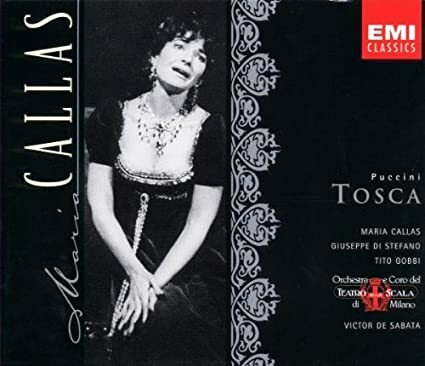 [Allan] Ramsay 'corrected' what he presumed to be an editing error but is, in fact, an interpretive subtlety that Callas incorporated into both her recordings of Tosca and all live performances following the first recording. At her entrance, she calls Mario’s name three times, each more insistent than the previous one, to indicate her approach; Callas and Legge worked assiduously to achieve optimal spatial results within the limitations of period mono recording techniques. The third and last 'Mario' is preceded by an agogic pause and is then elongated; it is also the loudest and the closest—the only one of the three that Callas sings at a normal distance from the microphone. Without consulting other Callas versions—including EMI’s own second Callas Tosca, apparently—Ramsay deleted the third 'Mario,' perhaps because it contains a slightly audible thump or sounded too different from the other two; he replaced it with a copy of the second. He then deleted the spaces, so that the three calls emerge dovetailed and identical, all spatial effect and musical subtlety removed. The effect is reminiscent of a defective, repeating CD. With the original third "Mario" replaced and its surrounding musical time eliminated, Di Stefano’s voice jumps in early, the initial sibilant of his reply 'Son qui' cropped." For a detailed historical analysis of the EMI recordings of Maria Callas, click here http://www.divinarecords.com/article...as_at_emi.html "
Is there any other singer whose every word and syllable has been utterly fussed over and attended to?-- on stage and off? Last edited by Marschallin Blair; Sep-09-2014 at 19:29. There were French Lords from centuries past who boasted of employing German barons in their stables. They were never so fortunate as everyone at Talk Classical who have your Callas commentary free for the taking. Last edited by Marschallin Blair; Sep-09-2014 at 19:42. As for the Callas articles in the magazine, they are beyond shoddy. The main article by Michael Tanner is peppered with inaccuracies. La Sonnambula was not Bernstein's operatic debut; he had already made that in 1953 in Medea. Fiorilla in Il Turco in Italia was not a new role for her in 1955, she had already sung it in Rome in 1950 and on the EMI recording of 1954, and so on, whilst reiterating some of the myths I thought I had been laid to rest. Clearly BBC Music Magazine is no longer a serious publication. I wait to read your thoughts after this event. I can expect that the results will be evident on top-quality equipment, but I wonder if my mid-range (low-range?) equipment will be sufficient for a difference to be heard - Roksan Candy player and amp, Mordaunt-Short Mezzo speakers??? I hope so, I really hope so! Last edited by Itullian; Sep-10-2014 at 02:14. "Paging Gramophone magazine! Paging BBC! Paging Opera Today! Paging Opera News!. . . You're critic is 'here.' Hi-re him." Last edited by Marschallin Blair; Sep-09-2014 at 21:25. To put it bluntly: this blows my mind. Please let us know what recorded format they use for the demo - i.e., CDs, or 24bit/96kHz FLAC downloaded files, or 24bit/96kHz FLAC on Blu-ray disks. I look forward to your assessment of the sound quality.